Our Elmsford Pest Control Exterminator will identify the source of the pest infestation & create a customized treatment plan to eliminate the pests. 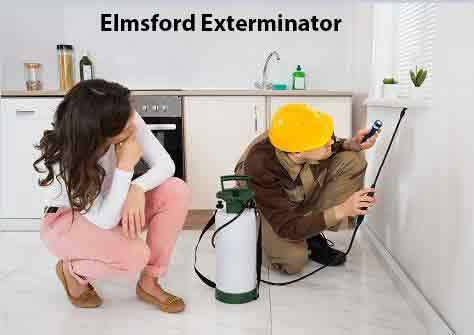 Let us be your Elmsford Exterminator that you can Depend On, Give Us A Call Today. 1-844-305-8999. Rats are a common complaint among residents of Elmsford NY. There are more than eight million Rats in total in New York City alone. Rats can also do a lot physical damage to your home or business. They easily chew through some types of siding and other building materials. They are also known to chew on electrical lines, thereby increasing the possibility of fire. They damage other materials as well, creating holes and gnawing on numerous objects. If you notice you have a Rat Infestation, Give Us A Call Today. Our Elmsford Exterminator will eliminate your Rat Infestation fast and efficiently. The Striped Skunk is an interesting component of Elmsford NY wildlife assortment. It is about the size of a house cat and has a very potent musk that often overshadows the beauty of its glossy and durable fur. Skunks can certainly be a nuisance to say the least. They are harmless; however, they can cause serious damage to a property while foraging for food. Skunks have strong forefeet and long nails, which make them excellent diggers. They dig large holes in lawns causing extensive damage. If you have Skunks on your property that you would like removed, Give Us A Call Today. We humanely Trap Skunks utilizing Havahart Traps and Relocate them. The Eastern Subterranean Termites are perhaps the most abundant termites in Elmsford NY. Unless you split open some infested wood, you’re not likely to see termites crawling around. It’s the Winged Termites also known as Swarmers or Termite Alates that alert you to a nearby colony. Termite Swarms usually happen March through June on warm, humid days after a rainstorm. If you notice you have Termites or would like a Termite Inspection, Give us a call. Our Elmsford Exterminator provides Free Termite Inspections.